Birds follow a different calendar than we humans do. Even though we’re still clinging desperately to sweet, sweet summer, their fall migration has already begun. Jewel-toned warblers are filtering through the five boroughs, with scads of songbirds spotted recently in Brooklyn and Manhattan. Eager to relive those heady migratory days of May, when we spotted tons of pulchritudinous passerines, we hit Inwood Hill Park on the northern tip of Manhattan, a very productive site indeed. When we arrived there, we were greeted not by colorful little parulids, but by a pair of massive raptors. William Blake had it right when he proclaimed, “When thou seest an eagle, thou seest a portion of genius.” The two immature Bald Eagles circling smoothly overhead were simply magnificent, natural rulers of this last primordial portion of Manhattan Island. We even spotted a Red-tailed Hawk fall into formation with them, following the old adage of not beating and joining. How have bald eagles, rare visitors to NYC even in the depth of winter, come to claim our smudgy summer skies? 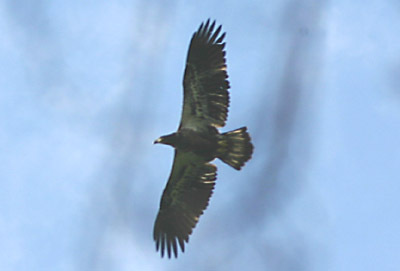 Consider this a tentative step towards reclaiming said skies; eagles once inhabited the lower Hudson Valley. Now, they visit highly infrequently, wintering no closer than Croton Point Park to the north. A concerted effort to reintroduce eagles to the area, led by the NYC Department of Parks and Recreation with the assistance of New York Department of Environmental Conservation, US Fish and Wildlife Service, and even British Petroleum America, is now in its fourth year. Arthur Middleton, who is intimately involved with the hacking effort, has written an excellent article about the past, present, and future of this project. Of course, the locals were predictably unfazed by the menacing birds of prey overhead. Little leaguers and aged joggers alike took a second to glance up and maybe, just maybe smile before returning to their busy lives. How I love my city! I guess I’m not much better though. Impressed as I was with the eagles’ aerobatics, these weren’t the birds that drew me to the park. I’ll have plenty of opportunity to enjoy eagles in mature plumage through the fall and winter. Warblers, on the other hand, are winging south RIGHT NOW! Too bad our favorite songbird spotting spot, an overlook in the shadow of the eagle hacking platform, is closed, for obvious reasons, for the rest of the summer. Not to worry, Inwood Hill Park presents 196 acres of bird-rich habitat. The salt marsh hosted Canada Goose, American Black Duck, Double-crested Cormorant, Great Egret, and Least Sandpiper. The woods were pretty quiet but we did manage to spot all of the common birds, including plenty of Northern Mockingbird and Tufted Titmouse. We saw three woodpecker species (Downy, Hairy, and Red-bellied of course) and three was the number of warblers as well. Black-and-white Warbler and American Redstart were welcome but not unexpected sights. More exciting was a Magnolia Warbler, our first in non-breeding plumage. Still, when all is said and done, the eagles stand out as the highlight of the day.